Every writer hears the voices. Whispers in their mind that offer encouragements and distractions. The voices are extensions of ourselves that drive us into the writing or place obstacles in our way. Writing is like working out. It’s a muscle memory activity that requires constant attention for improving skills and raising stamina. Try sitting down and writing non-stop for five minutes. Set the timer. For some, getting started feels like an eternity. For others, the end of the effort seems too far to reach. The voice in these cases throws out distractions such as “now is a good time to read some random articles or catch up on email.” Or you know you’re in trouble when the voice suggest taking care of the chores as more interesting than writing. The Five minutes is not a finish line, but instead, a marker of progress. After several five minute sets, the writer extends the time to ten minutes, then twenty minutes, then forty minutes. Soon, time no longer holds apprehension. The voice is a quiet humm as you write, immerse in the zen of the flow of thoughts translated through the movement of fingers. The writers on this blog exercise their writing muscles, and seek the zen of the flow. The process is never easy, at least not if one strives to be better with each word. I invite you to read this month’s engaging posts, and meditate on how the writers explore their voice, stretch their writing muscles, and find the space where the voice simply humms. 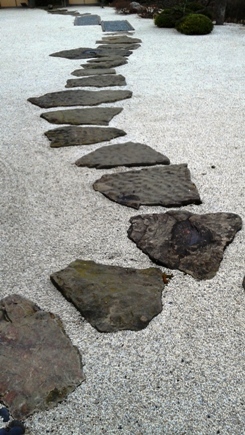 I like the zen of the photo – reminds me of a photo I took on a cloudy cold March day in Chicago. A blank page is the writer’s nemesis. Writing/typing “The” or “Start” or “In the beginning” can be the most useful thing. Just five minutes of writing can easily lead to ten minutes or more. I tried doing that this past week and completed a couple of short pieces. Yea! Now back to the longer, harder manuscripts.